She's buzzed inside just before they open fire. Inside, Reddington (Brian Petchey), Douglas Collings (Les Carlson) and Steed hear her undercover operation was blown, and she says no-one knows the identity of "The Fox". Collings leaves, but Reddington wants her to say how her cover was blown. What she does know is the date of the next payoff, and the courier - Alkoff. Alkoff (Don Corbett) leaves his apartment, ignoring Purdey disguised as a char in the hall; Steed and Gambit follow him in Steed's car while Purdey	trails after them. Alkoff heads to the lake and Purdey guards the park entrance while they follow him in. He takes a boat out into the middle of the lake and waits... Steed and Gambit are amazed to see a waterskier pickup the case of money, then land running and hop into a getaway car. They give chase but the skier eludes them. He stops to mop his brow after wiping prints from the car and we see him revealed as Collings - but Steed and Gambit have caught up. 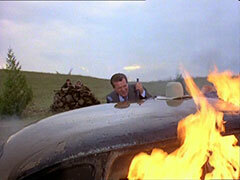 He dons his mask and escapes by stealing another car, and Steed's Jaguar gets bogged so he escapes. Steed calls Purdey to help them dig the car out at about the same time a patrolman finds The Fox's stolen car. The New Avengers meet Collings and Kenneth Phillips (Richard Davidson) at the scene. Phillips is annoyed at being uninformed about the case, and Steed and Collings indicate he was a suspect in the case. Steed, seeing them dust the car, remembers The Fox left his handprint on the roof of a vintage Plymouth in the garage and they set off for the garage, leaving a scowling Collings in their wake. He calls two of his men to help him out. They arrive at the garage and the mechanic (Don LeGros) tells them the car's called Emily, and belongs to a Miss Daly, who's already collected her car and gone shopping. They find Miss Daly (Jane Mallett) - a dithery old dear - who points to her car, just entering a car wash! Purdey sprints across the street and lies across the roof to prserve the print, leading Miss Daly to ask, "Does she do that often?" Purdey emerges, looking a million dollars, except her skirt has shrunk (make that two million dollars). Phillips says he'll call forensics over, but Steed says it'll be safer to go to them. Phillips arranges for them to borrow the car off Miss Daly while Steed tapes his bowler over the print. Kalenkov interview the mechanic and then spot the car go past and follow them. 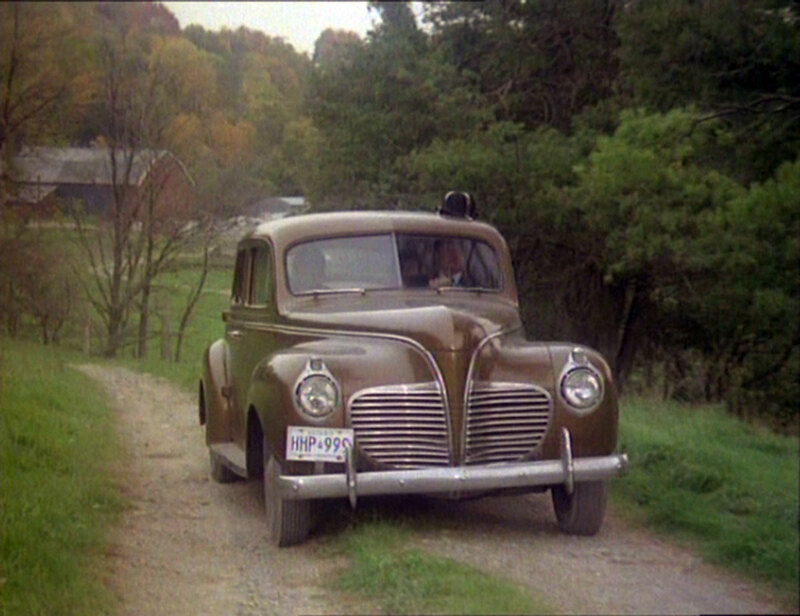 Miss Daly's shopping is still in the trunk, and she asks two policemen (Sandy Crawley and John Kerr) to retrieve it, who tell the radio operator (Jack Duffy) to notify all cars. Kalenkov calls Mirschtia, saying he's on the trail as Steed turns onto a country by-road to head back to Toronto and they arrange an interception. He pulls into a diner and waits - then Emily pulls in. Phillips spots Mirschtia's car and investigates, but is shot. The pump attendant thinks Gambit shot him and calls in the police. Meanwhile, the first cops see 'the car with the shopping' and set off in pursuit. Steed won't pull over because they might be impostors. Collings takes Mirschtia's car and sends his minions off to search the back roads. Steed meanwhile is running a police road block and Emily starts overheating about the same time Collings arrives at the road block and is pointed down the road they took. Steed pulls into a chicken farm and tells Gambit to fetch water, while he gets some eggs - which he cracks into the radiator, to plug the leaks. The chicken farmer (Ed McNamara) spots them and fires his shotgun at the departing car, puncturing the fuel tank. Just up the road, they run out of fuel but Gambit notices a cabin nearby with a moonshine still outside. The giant moonshiner tending it offers them some hooch,	and he and Purdey sip a bit. Purdey asks to buy 6 gallons and the rustic agrees - if he can fight Gambit first. They trade fisticuffs, then Purdey belts the man and they take some moonshine - leaving money for it, just as Steed had for the eggs. They're spotted by some more cops (Pat Patterson and Bill Ballentine) and hide in a car junkyard - until one of the cops spots the bowler hat. The cops circle the car and spring the trap - finding an elderly amorous couple in a different car, Steed's bowler swapped for the man's Stetson, which now adorns Emily as she drives off. Emily is then ambushed by Collings, armed with a mortar and the car is destroyed - although they take turns at chiselling at the roof before it explodes. They think they've lost when it goes up, but the loose piece of roof falls near them, hand print still intact. 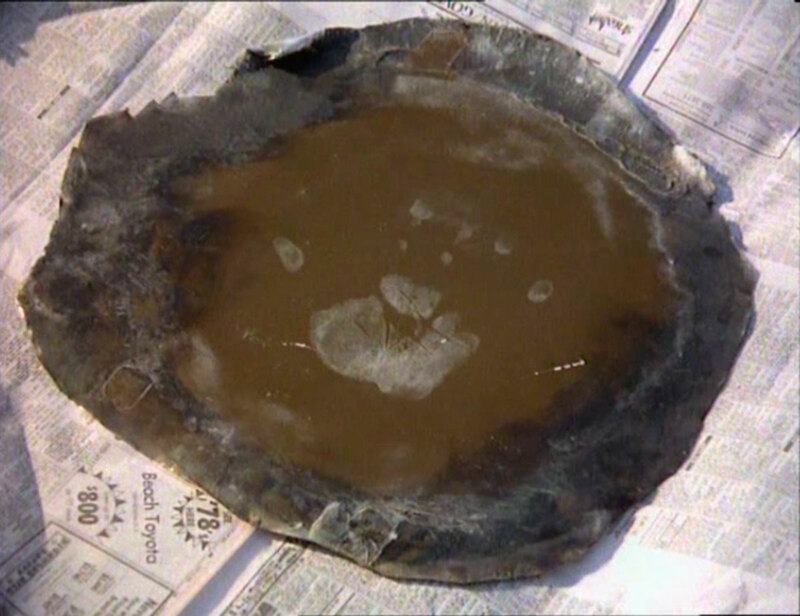 Later, Collings' smile is wiped off his face when he's prsented with the roof piece and arrested. Later still, Miss Daly is presented with a replacement Plymouth, and the roof piece, and the New Avengers are astonished when she describes Collings to a T from his hand print - she dabbles in palmistry!